…would you like wheat bread or rye? Oh, you thought “knuckle sandwich” meant something else? No, no. We’re serious about sandwiches around here. In fact, knuckles are quite useful for all manner of food prep. Especially if you have the Knuckle Pounder Meat Tenderizer Pounder Metal Gadget on hand (ahem). 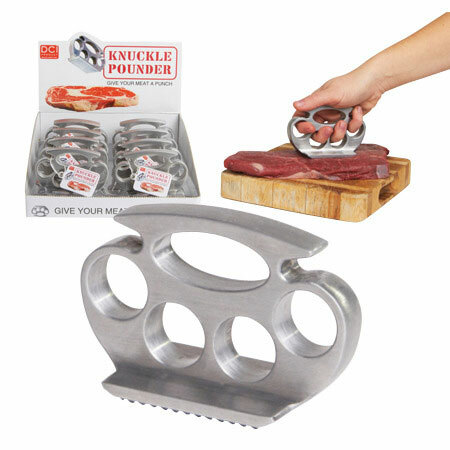 Get out that pent-up aggression while preparing your meat with this cool Kuckle Pounder Meat Tenderizer. Looks just like traditional brass knuckles but instead of “knuckles” there is a tenderizer grid. Its made of heavy aluminum alloy & its grooves make it easy to hold and pound the meat. Now what are you waiting for? Pound it out !